As much as this is more of an online CV than an often-updated “proper” blog, I’ve recently been thinking about tablets. 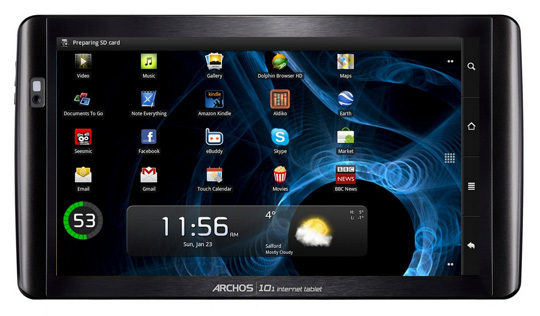 It’s a week since my Archos 101 arrived, and I’m a bit in love. And I’m slightly richer (or less-poor) than if I’d bought a big iPhone. Oh, and I have Flash*. I’m pretty indifferent to Apple – I don’t hate them, my work machine’s a MacBook. The Archos, however, is half the price of even the wifi-only iPad. I really like Android – I have an HTC Android phone that I LOVE. Android’s easy to develop on as well – not as polished as Visual Studio (but smaller), but it’s very open. The Archos isn’t one of the cheap generics flooding the market (some of which might be great – I don’t know!) Archos have a history making media players, and this is fine for browsing, music (good speakers) and video (HDMI out). I get stuff I actually want – a proper USB port (!) for flash drives, external hard drives, etc. ; an HDMI port, and a big enough screen to make it worthwhile (and not a slightly-swollen phone). I’ll settle without an aluminium body for the price, and I’m happy to use my smartphone if I really need 3G data – the Archos will tether fine. For one thing, it’s actually an OK ebook reader. I’m not that into ebooks, but there’s a Kindle app if you really want it. Personally, I find it quite easy for having papers to hand while I’m typing, without having to switch screens a lot, or use paper (arduous, I know). I’m all synced with Google Docs (which I was using anyway) and can work with documents, spreadsheets or slides easily, all things in – it really is direct manipulation, after all. Speaking of Google, the Archos’s Android OS naturally assumes that I use a Google account, so my Gmail, Calendar and Tasks are added to the home screen within a few screen-presses of unboxing. It doesn’t come with the Android Market – for Google’s licensing requirements – but it’s very easy to get it – not some techy hack, but a few clicks on the built-in app installer. It’s not something I covered in my degree, so I don’t think it’s inaccessible to those not blessed with the secret of computer science. The stock Android browser’s ok, really, but I’ve taken to using Opera, which, frankly, is very nice and shiny – it’s not phone browsing. I don’t like Dolphin Browser, but that runs fine for those who like it – in any case, there are loads of options. I’ve been thinking though, is there a role for using tablets in CS learning? Phones might be more realistic in availability (Android is gaining ground fast). But you still can’t develop real desktop-equivalent apps very seamlessly. Maybe the added screen-estate of a tablet will, in time, make them reasonable to play with as programming toys. Certainly, the App Inventor opens Android development to something pretty similar to the block-based teaching tools, albeit with a more complicated API. Price-wise, lower-end tablets are getting fairly accessible, but I admit I haven’t thought this that far through – it’s just a musing! 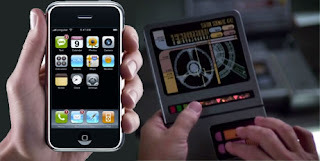 Being a geek, a Trekkie (see the PADD above) and a kid at heart, I find Trek-style touch-screen tablets very cool. Maybe I’m as much a Google fan as some people are with Apple. * Yes, I know, but apoplectic diehards can be quite funny.